The full heat of summer is here and I’m drowning in tomatoes. I’ve been searching for new ways to use my bounty, beyond the basics of salsa, marinara sauce, and jarring for winter stores. 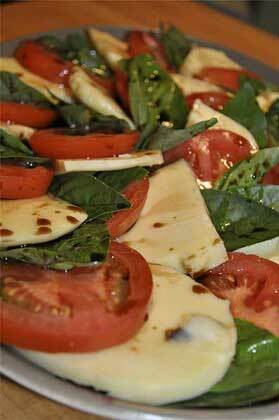 Mozzarella is one of the easiest cheeses to make, it only takes 30 minutes and the taste can’t be beat! Now off to find those interesting ingredients! Mike Bloomberg is a mayor with a mission. More specifically, a public health mission: Over the course of a decade he has made New York City a laboratory to test policies that manipulate the healthiness of public environments. His much-protested idea for a large-soda ban comes from a long lineage of much-protested smoking bans and trans-fat bans that have tested what, exactly, government can and cannot do to encourage healthier behaviors. Some of Bloomberg’s ideas have proved remarkably effective in making New Yorkers healthier and become models for national policy. Some have flopped, showing little public health impact or running into trouble even getting off the ground. From smoking to soda bans, here’s a quick tour through Mayor Mike Bloomberg’s public health crusade. NYC first major city to ban smoking in bars and restaurants. Bans the use of trans-fat in all foods. Requires restaurants to post calorie counts. Proposes a voluntary effort on behalf of Americans’ food producers to reduce salt consumption by 20 percent. Congestion pricing for cars entering New York City. Limit access to sugary sodas. I like to think of thermal solar power as the rock star of clean energy. The technology starts off with the coolest name, the Power Tower. The Tower is surrounded by thousands of adoring mirrors all focusing their attention on it in the center. As the mirrors build up the heat in comes the molten salt gathering in all the energy (heating up to 1,000 °F). Then the salt exits stage-left to the green room (thermal storage stank). In these tanks none of the glory and fame is dissipated since they barely lose any heat (98% efficiency rate). At any moment the rock stars can be called out to overwhelm their fans by turning water into steam and creating energy (via steam turbines). This means that energy can be created at night and without wind, and without requiring the use of the toxic chemicals that solar cells require. Yeah, it’s a pretty cool technology. 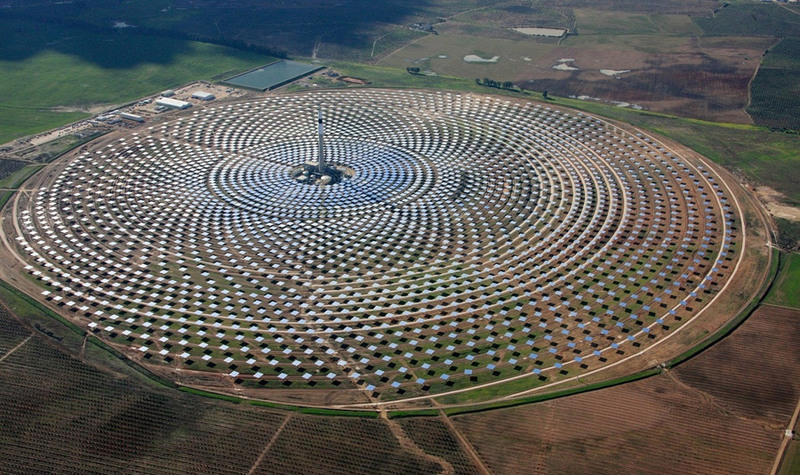 The picture above is from Seville, Spain, the site of the first thermal solar installation. It will generate 20 MegaWatts and power 25,000 homes. The technology offers an interesting twist on clean energy, using a blend of the old and new. It’s steam turbine is the same technology used in coal and nuclear power plants. Steam power is hundreds of years old going all the way back to the 18th century steamboats and railroads. The twist here is using solar energy as a heat source, i.e. solar powered. In comparison to other clean energy technologies it definitely has a few advantages. As mentioned above it can run at nearly any time (close to 24 hours), but more importantly it doesn’t require the rare materials that solar cells need. This is becoming more of problem than you would think. As China dominates the market, owning nearly 85% of all the world’s supplies. Putting the rest of us in the awkward territory of tariffs and reliance on the Chinese solar industry. Further, the creation of solar cells is a notoriously dirty process. Many are even comparing the pollution between coal burning and the creation and disposal of solar cells.